This week starts the last five weeks of the year and looking at my 6 x 6 Challenge list, things are looking pretty tight. I have five more games to get in to complete my challenge with Walking Dead dragging its heels with the least games played. Sad as I thought it would be one of the easiest to complete but I got a bit sidetracked. Since the remaining items seem pretty straight forward, I’ll be focusing a bit more energy to get Walking Dead to the table to try to finish out my Chapters series and mess around with some of the new missions in the later rule books. After Walking Dead, I will have a few stragglers with one game left each. Championship Formula Racing should be easy to get a game in again and I plan to do that this week. Dropzone Commander has it’s last game already set up on the calendar as the local group completes another game in their ongoing Winter Campaign. 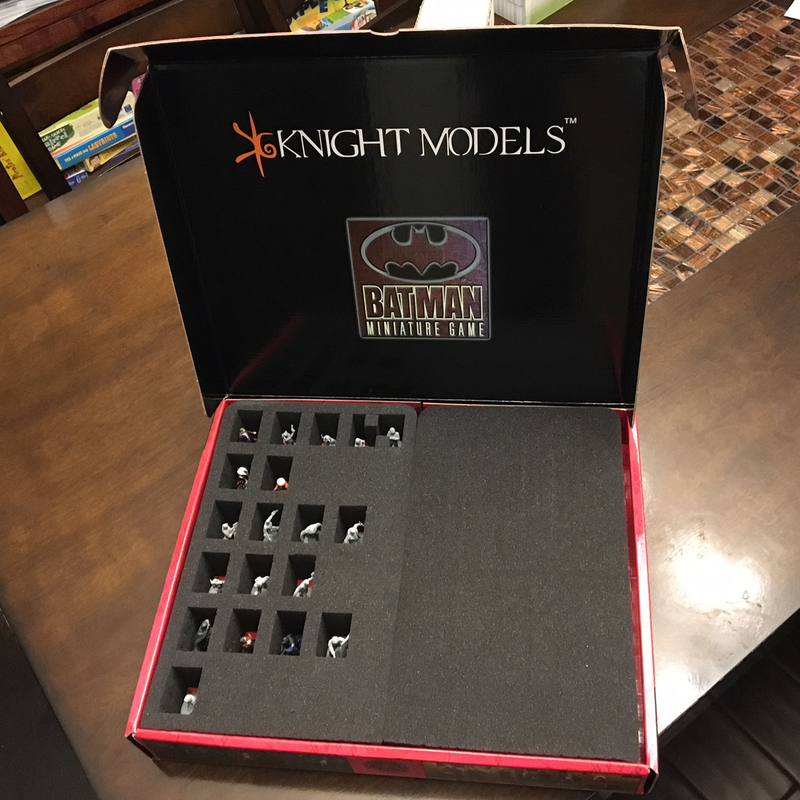 That leaves Batman Miniature Game. We’ve been moving right along with our BMG sessions and so I’d like to try to hit one of the campaign scenarios in the Suicide Squad starter. That will be a bit ambitious as all of those scenarios require the Suicide Squad team, which I haven’t started painting yet (and I’d really like to play with painted models). Probably a long shot to completing that option but what is life without lofty goals? I can always fall back on our regular 200 point game if need be. 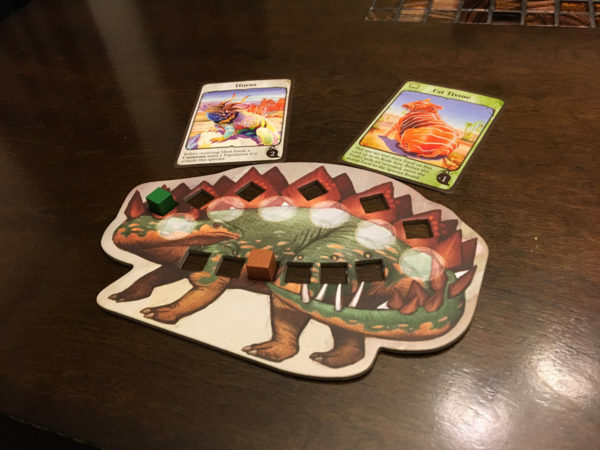 In other news, we started playing Evolution Climate from North Star Games a little bit and my friend reminded me of a goal of his to add a little more theme to the game. 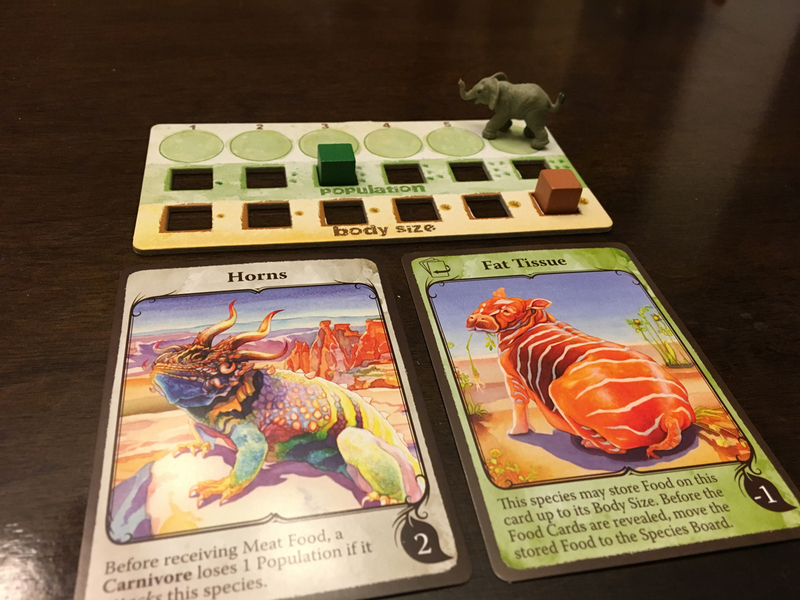 The game represents the management of new species that evolve to gain the most food every round and the game includes these nondescript trays to hold your species’ stats. We always wanted to give a little more info or theme about these species we were creating so we thought about maybe cards or different tray designs. 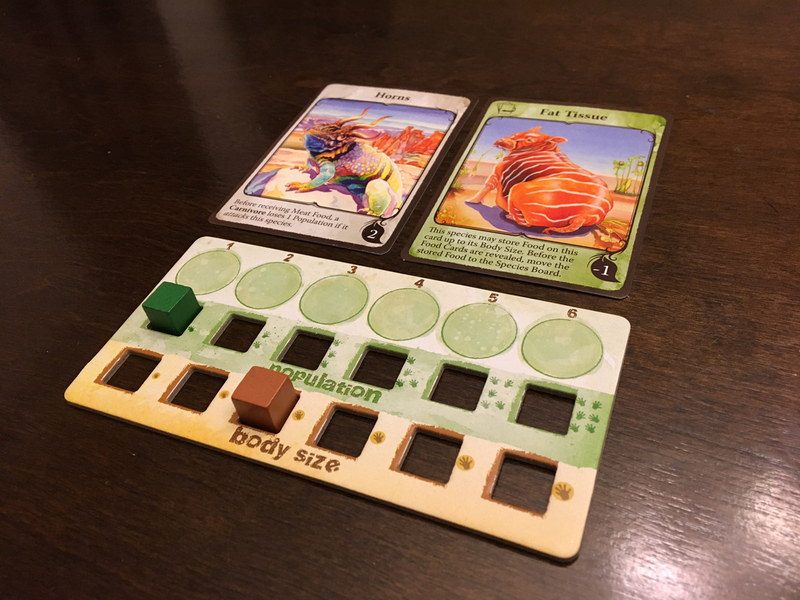 Then I picked up a promo set at Gen Con and thought we had the solution. 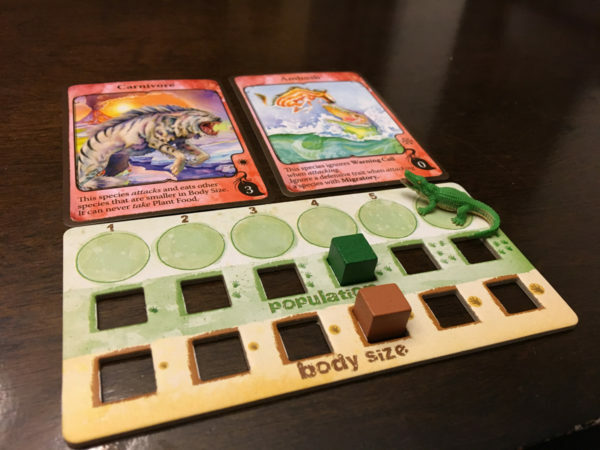 While these new custom trays are much better visually than the standard trays, other players found them difficult to determine key things like my species’ population or body size. In addition, there are only six of them in three separate designs. That means not enough trays to go around and the variety is limited to the three dinosaur shapes printed. We started brainstorming and thought maybe cards that you randomly draw from a custom deck could work. These cards would have descriptive names of some animal on them. This could then help you imagine that you were creating some type of new bat or caribou or whatamaroo. I was thinking about this a bit more and while at Michael’s, I found a nice alternative. These little plastic creatures (on the upper left of the tray) come in assorted packs of differing shapes and are relatively inexpensive (especially if you buy them over the course of a few weeks with the store’s weekly 40% off coupon). I think this can give the species a little bit of theme while staying out of the way of the game mechanics. I’ll have to get this to the table and see if it works. I’m also behind in my challenge. I got several games played this month, but I think I still need to get 8 played before the end of the year. I might swap a game out for something that plays a bit quicker, but haven’t decided that for sure. Yeah, I know I play way more than 36 games in a year but it’s funny how this still sneaks up on you. I’m pretty sure I hit both Dropzone and Batman at least once in the beginning of the year but it was before I started and I don’t have anything to write it up with. It won’t matter, I’ll soldier on and try to finish this one out. Solo games are the only way I could have done this as I knew it would be tough to get all the games in while trying to juggle other people’s schedules.